"A portrait of my children, once a week, every week, in 2012." Che: Ice-cream in China (he always forgets to say China-town, hence most people think we've been to China recently). Poet: The Tasmanian wind - cool, crisp and, at times, wild. 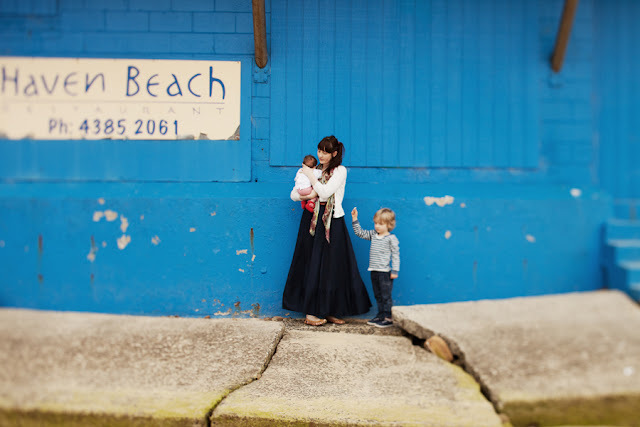 I was recently interview by Bron for her "Meet the Mama" series. You can read the interview here. Also, if you visited here yesterday you probably couldn't find me. It turns out that Che & Fidel was temporarily deleted from the internet. As you can imagine, I freaked out. Magically it returned but I'm still a little suss. It was just the incentive I needed to organise photos and stories and print them in a book. Thanks blogger - but please don't do it again. The guys from A Common Ground know how to create an unforgettable event (even if they confess to being pretty bad at organising anything). Under the apple trees at Fat Pig Farm we snacked on Southern-Tasmania's best produce while the children climbed apple ladders and filled buckets with pink ladies. Fat Pig Farm belongs to Matthew Evans - aka the Gourmet Farmer. Days earlier I had the privilege of interviewing him (and Ross and Nick) at Puggle Farm in Cygnet, his home that's so often featured on the tv show. Over tea and apple cake we discussed good food, the people that grow it and the lessons we can learn from them. There's no doubt that, as a nation, we are becoming more aware of where our food comes from. But I'd never been in a place quite like Cygnet - where the local IGA Supermarket sold organic milk in a glass bottle and 5kg bags of organic flour. Cygnet has a strong community of artisan food makers and self-sufficient folk, keen to share their knowledge and their produce. As Matthew says: "...they're the people who do things the long way and the hard way....and they do it over and over again until it tastes right. And good." Before I met Michelle I felt like I knew her. Such is the experience when blogger meets blogger. Michelle and I, we've been reading about each other's lives for years now, commenting on stories, household additions, sweet photographs. If Michelle went through her archives she would probably have at least a hundred comments from me regarding food. You see, she's a food curator and jam maker. 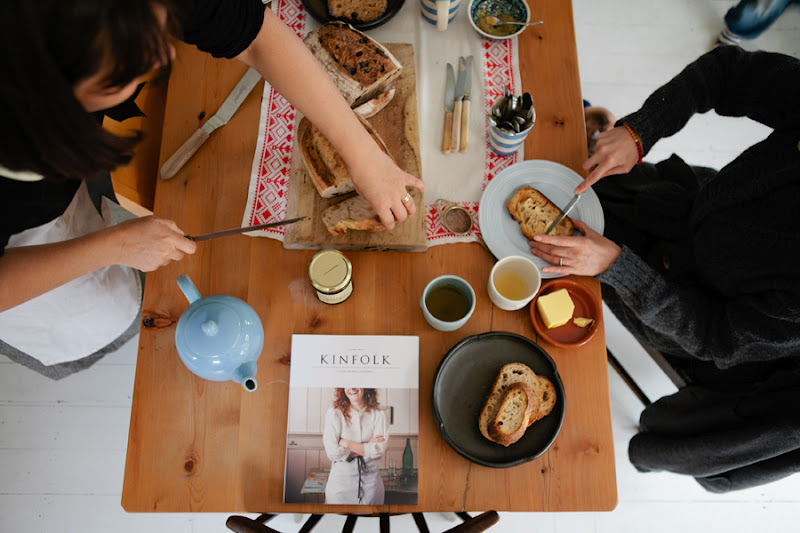 She dabbles in cookbook styling and home making. She cooks from the heart for her family and her friends. After years of drooling over her edible creations and her magazine-worthy abode I finally had the opportunity to step into her life, for just a day. I'm pretty sure I sighed when I walked into her kitchen. Daniel wasn't quite as subtle: "Oh, I feel like I'm walking into a magazine!" he exclaimed. The Rayburn was fired up, there was apple cake on the table, sourdough on the chopping board and, everywhere I turned, there was a little detail that caught my eye. A collection of beautiful, rustic details that had both practical and aesthetic purpose. She had picked apples from her tree the day before and, earlier that morning, stewed them for Poet to eat. Yes, that's right, my baby snacked on Rayburn toast and applesauce - as you do. While the children played, I watched Michelle make plum jam, stirring the fruit in lemon juice while filtered Tasmanian sunlight poured through the windows. Prayer flags hung just outside the door and washing (all those thick wintry socks) dried on the hills hoist. 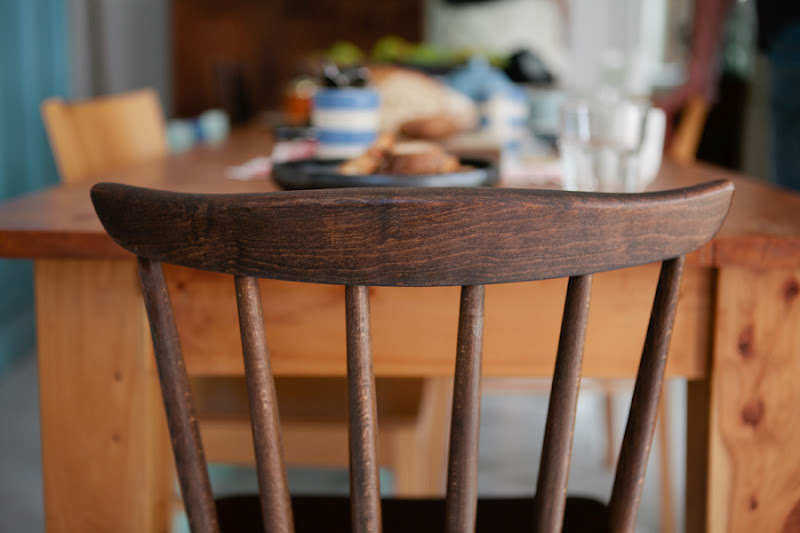 I sat at the table, mentally noting the rhythm of the home while Daniel and Luisa filmed and photographed. I adore Michelle. She is beautiful, gentle and wise. 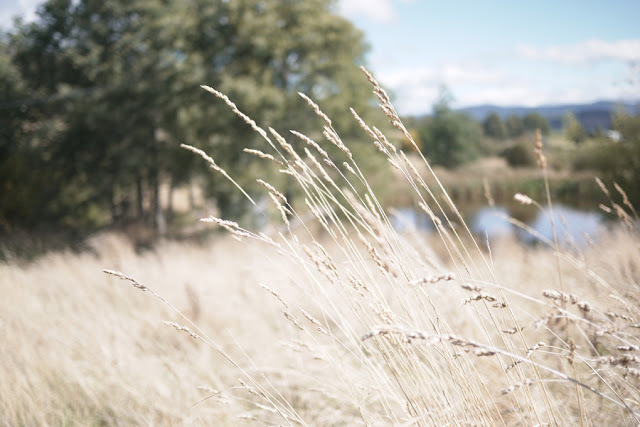 She moved to Tasmania with her husband eight years ago, seeking a quieter, simpler life. And she has created just that. I reluctantly left her house that cold, crisp day with an enormous amount of gratitude - it was just so lovely to be invited into her home. Being in her space, watching her create and witnessing a snippet of her family life really affirmed for me the beauty in simple living. I'm all inspired now, to walk my family down that path of simplicity where the air is cleaner and the food is so much sweeter. Sure, I'd love to move to that country house with the plum trees and apple orchard - right now - but alas, that won't be happening just yet. Once again, I mentally repeat: bloom where you're planted. We are home - exhausted and inspired. 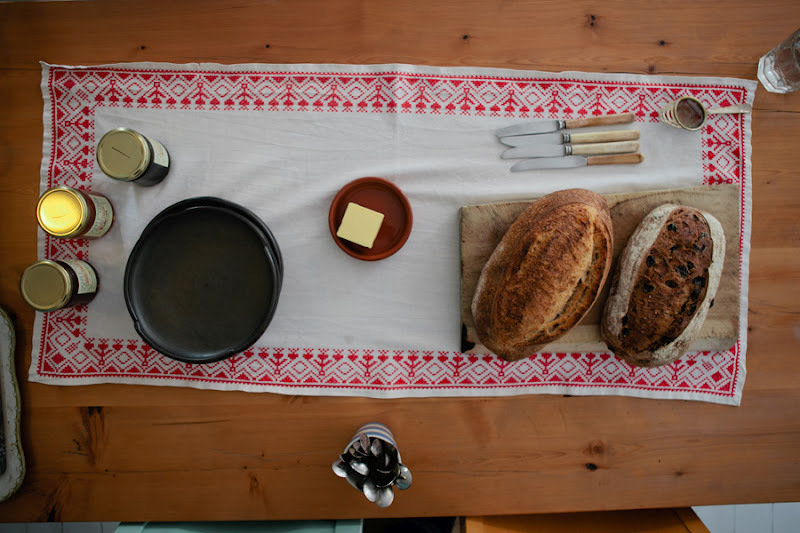 When we bundled into the house late yesterday with our suitcases, stories and jars of homemade jam, we agreed that someday soon we would return to Tasmania. You see, six days is nowhere near long enough. A real holiday is a month - time to settle in, explore and soak in the ambiance. Travelling is tiring and travelling with small children is exhausting. I'll put my hand up high and admit that blending work and family was challenging but, as Daniel pointed out, if it wasn't for my career, we wouldn't have been blessed with such a wonderful opportunity. And wonderful it definitely was. The apple orchards were in full bloom, the vistas in both sun and rain were incredibly beautiful. We were deep in the countryside where simple living was priority and subsequently, we returned home with a greater awareness. But you know what made this trip so unforgettable? Being welcomed into the warm homes of new friends. 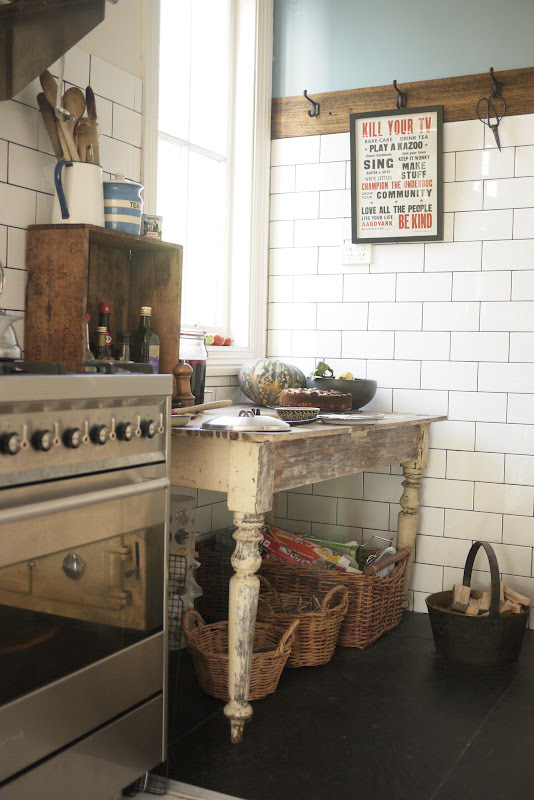 Family homes that were achingly beautiful; full of home-grown, homemade and just-baked. Friends that shared knowledge, offered advice and cuddled my children. Over the next few days I'll be sharing a little bit more about Tasmania because writing blog posts is far more enticing than unpacking. Photos taken by photographer and travelling companion Luisa. The setting? Michelle's to-die-for kitchen..more on that (and her) tomorrow. I'll be visiting the very talented Miss Haidee in her studio when I'm in Tasmania. She lives in a place called Peppermint Bay (of course she does!) and there she crafts signature dresses, tunics and bloomers from the most decadent vintage linens. Each garment is entirely unique and utterly whimsical, there's a little love in every stitch. Haidee sent me this delightful tunic to gift one of my readers (it will fit a size 2 as a dress but it's designed to fit till about age 5 - it just gets a little shorter, obviously). She is also offering you a 30% discount in her online store with the code: poet. To enter this giveaway all you need to do is become a follower of Che & Fidel and leave your name and email address - international entries welcome. Comments close March 31st. The random number generator will choose a winner and I'll add the details to this post. "There is so much mass production and poor quality in the clothing business...I believe it's really refreshing to own an Australian one-off designer piece. Handmade is a labour of love which makes it so enjoyable to wear! I work from a studio nestled by the bay, an Aladdin cave of sorts, a treasure trove of fabrics and embellishments. It's not very organised at the moment but I know where everything is." - Haidee. I'm enjoying the way that these portraits are, rather unintentionally, working as diptychs. Che: Late afternoon in Popa's shed. A treasure trove of bits and pieces, found and kept. Poet: In baggy denim amidst the toys when her big brother is at school. Oh, the possibilities. Lover of Vintage gifted me a sunshine award. Thank you! Nothing like a bit of light to lift the day. Favourite colour? Hmmm, it changes with the seasons and my mood. Right now I'm loving olive green, sunshine yellow (apt, I know) and soft grey. On the topic of colour I particularly like the words palette, hue, sorbet and pastel. Favourite animal? Meerkats and sloths. Odd creatures. Favourite non-alcoholic drink? Cappuccino or tea (of any sort but especially nature's cuppa, peppermint, chamomile and nettle). I clearly remember the days that I spent reading The Divided Heart for the first time. Che had a serious fever so I lay with him in bed, breastfeeding on demand, flicking through the pages of Rachel Power's book when I wasn't comforting him. It was a fair few years ago now but the message imbued within its pages still resonates with me. "The divided heart; a split self; the sense that to succeed at one is to fail at the other." Motherhood for me has been a series of successes and failures. Indeed, you can't have one without the other. I'll admit that it took a good while after birth for me to find my 'voice' again - to write creatively and passionately. Before then, the sentences just didn't come together. I don't feel like I sacrificed my artistic self for motherhood - it just took a back seat while I navigated those first few years. It took a while for me to recognise my new self and artistically I was silent. During that time there were many days where I flicked open my now dog-eared copy of The Divided Heart to seek some reassurance and inspiration. In a series of deeply honest interviews, famous Australian women (and some not so famous) discuss the challenge of being a mother and an artist. The Divided Heart is a beautiful blend of intellect and conversation - raw, moving and personal. It explores the pain and the joy of being a mother and an artist and, at its very core, it offers a comforting reassurance: it is possible to do both, it just takes time. I have one copy of The Divided Heart to give away. All you need to do is become a follower of Che & Fidel and leave a comment with your name and email address. This giveaway is open to international readers and will close March 28th. A winner will be chosen using the random number generator and I'll update this post with the winner's name. Comments Closed. The Random Number Generator chose #22 - Tara Lucia Zaicz - congratulations lovely one! Q: When did you first think of the concept for The Divided Heart? A: I really can’t remember the initial spark, but in general the book came out of the psychic shock of becoming a mother; the way it brought everything else in my life into question. I know people roll their eyes at this — “It’s not like you’re the first woman to have a baby, lady” — but I think few of us are prepared for the way mothering tips our lives upside-down. Few, if any, experiences come near the emotional and practical impact of having children. I had studied art history at university and I had largely swallowed the myth of the artist as a solitary, brooding, extreme character not really fit for everyday life. I didn’t have a picture of how an artist might pursue a creative career alongside, let alone within, a domestic life. Also, now that I was confronted with the enormity of the job of raising kids and maintaining a house, I gained a sudden insight into why — traditionally at least — it might have been so difficult for women to become successful artists. This all seemed like very significant and largely unexplored territory to me, especially within the Australian context. Q: How did your experience, as a mother and a writer, affect the creation of the book? A: As a mother, it made it very slow! It was a stop-start process, interrupted mid-way by the birth of my second baby, but of course mothering was my subject, so really I was just describing my life as a new mother torn between my need to write and my passion for my kids. Of course, the book is really a distillation of the most heightened, extreme moments of that time, because it’s in those moments that you have the strongest need to express yourself. This inevitably means there are some readers who react against the book’s perceived intensity or self-indulgence. But personally I think you’ve got to milk those extreme moments, because that’s where the greatest honesty lies, and where you’re most likely to be tapping into something universal. Q: How did you get all your interviewees involved? A: I didn't really know that I was writing a book when I first started. I was just hungry for answers to what seemed like this problem of combining art and mothering, so I began sporadically approaching artists I admired. Of course I’d done huge amounts of reading and thinking on the theme, so I arrived at interviews full of passion and ideas. What I wasn’t prepared for was how articulate these women were about their experiences. With some, it was as though they’d been waiting years to have a serious discussion about the subject, which obviously loomed so large in their lives. That’s what turned mere interviews into really exciting conversations. It was really their enthusiasm for the project, and my sense of responsibility to them, that gave me the energy to continue. Q: What was the journey like for you as a writer - what did you learn professionally? A: It’s always difficult to know what you learned from a project. I know what I’d do differently if I wrote The Divided Heartagain, but that doesn't necessarily help me with the next book! Perhaps the most important thing I’ve learned about writing generally is that the best ideas come from some liquid world that flows beneath the surface of our conscious mind. The challenge is being available to receive those ideas when they swim up to meet us — not easy for mothers, who are so caught up in the demands of the material world. Also, I’ve learnt the importance of recording those ideas straight away. If you miss them the first time, they rarely come back again. The other challenge for me is not losing sight of why I write in the first place; difficult when time alone is so scarce you’re almost crushed by the pressure to use it meaningfully. (The temptation to just cut your losses and do another load of washing is always fierce!) That’s why kids are such great teachers when it comes to making art; they’re not focused on the outcome, they’re just engaged in the joy of making something. Q: Did you approach your role as mother and artist differently after writing the book? A: Not differently enough! I’ve realised that there’s a reason why it was me (and not somebody else) who wrote The Divided Heart — because for me the internal conflict between creativity and mothering seems to be particularly extreme. Firstly, I am a very slow writer and not very good at switching my creative brain off and on, not helped by being constantly interrupted! Also, I am really bad at withdrawing, physically and psychologically, from my family. A while ago, my partner took our kids to the adventure playground in St Kilda and writer/comedian Catherine Deveny wandered in with her three boys, set herself up at a table with her laptop and told the kids to come back only when they’re starving. Man, that woman rocks! I am way too pathetic for that. I’d be following them around the park all day trying to make sure nobody breaks an arm. For me, the state of mind required for family life — not just the mothering, but the constant wrestling with the beast that is housework, bills, cooking, washing and preparing whatever uniform/instrument/note/lunchbox is required for the next day’s activities — feels the complete antithesis of what is required for creative work. Well, I’m bad at it, anyway; I know others who manage it with great flair. Also, I have a day job, so writing is pressed in around the edges of my day-to-life. That said, if there’s anything I did learn from writing The Divided Heart, it’s that there is no substitute for discipline — and this is probably truer for mothers than anyone. Mothers need to give themselves the permission to carve out time for art, even if it’s only half an hour a day, and then the discipline to use that time wisely. Q: What has been the general response from readers? A:The lovely thing about writing a book like The Divided Heart is that your readers are mostly people just like you. So when readers contact me, I always respond, and it’s like emails between friends. A lot of women have sent me detailed messages about their own situations and struggles, and that is always very moving. It means a lot to me to know that the book offered solace or inspired someone to keep making their own work. Of course there have been those who have reacted against the book — either they see it as a bunch of whinging women with white-goods who don’t know how good they’ve got it, or they just don’t relate (or don’t want to admit) to the maternal ambivalence I talk about. There are also those who immediately perceive the book as dark and as negative about mothering. I feel like I’ve got to constantly assert that it’s precisely because I love my kids so much that I experience such intense internal conflict. Otherwise I would have just outsourced their care and spent my time writing and it wouldn’t be a dilemma, would it? Women need to be able to talk about how hard and confronting mothering can be — as well as how joyful — otherwise we’d all go a bit mad (or a bit madder, in my case). Q: What's your next project? A:I have just abandoned one novel to start another (still in embryonic stage). The abandoned one was almost a fictionalised version of The Divided Heart and I think I will come back to it. I’m not entirely done with the artist–mother thing yet, but I feel like I need a break from that particular obsession. (If you are looking for a great book on the theme, though, I highly recommend my friend Peggy Frew’s House of Sticks.) Everything I write is about relationships of one kind or another, but this new story was inspired by a news item I read recently rather than directly out of my own life — which, frankly, is a bit of a relief. Packing for a family trip requires a certain amount of methodology. I don't have a methodical bone in my body. The mere thought of packing a weeks worth of clothes for Che, Poet and I has had me procrastinating for days. Hence, it's the night before we leave and I'm in a sea of wintry layers wondering what on earth I should take and what really needs to stay behind. "It's easy," says Daniel (Mr Methodical). "Just put aside 6 pairs of undies, 6 long-sleeved tees, 6 pairs of socks..."
In the scheme of things Che is quite easy to pack for. But Poet? She has tights and leggings and bloomers and booties and beanies and nappies and bows. She has a pretty gorgeous new mama-made lavender cardi too...lucky girl. I'm thinking of stripes and florals, woollens and pyjamas and the fact that she's a messy eater and a new crawler - hence, a lot of clothes are necessary. As for me? I'm nowhere near figuring out what I need to wear. I'm going as a mum/journalist/photographer/person-to-be-photographed. I need practical and professional, warm and stylish, comfortable and chic. Possible? Probably not, but I'll try. When in doubt I'll cover the Vegemite stains with a wrap-around scarf and wear red lipstick. Preparing aside I am so looking forward to Tasmania. 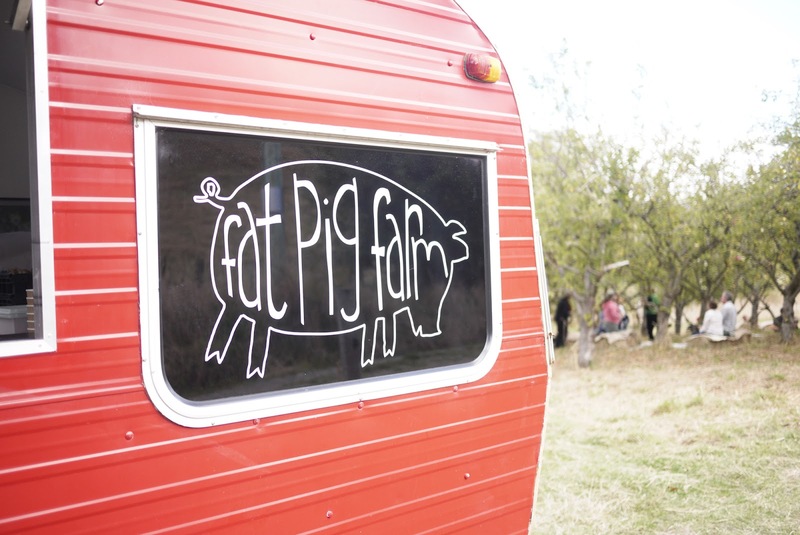 I'll be interviewing the guys from A Common Ground, visiting Fat Pig Farm (aka. The Gourmet Farmer's abode), eating Tasmania's best produce, hanging out with Michelle in her to-die-for kitchen and meandering around Salamanca. It will be busy but wonderful...I just know it. Till I get back...enjoy a few posts I've pre-written (including two scrumptious giveaways) and I'll see you on the flip-side - with a plethora of stories and even more photos, I presume. My post on The Face of Birth received a range of comments - some embracing the film and my discussion, other dismissing it and accusing me of judgement. I've thought long and hard about those comments and how I should receive them. Us mothers, we are fierce. When it comes to birth and our experiences we fight for what we believe. Indeed, the mere mention of 'birth' stirs the fire within us. And thank goodness it does. It signifies our journey into motherhood - if we didn't have so much passion and energy how on earth would we raise our children? I will never stop discussing birth on my blog because it is something I am deeply passionate about. My own birth experiences have inspired me, teaching over 400 pregnant women over the past few years has encouraged a compassion within me that I never knew before. I write as a mother, a pre-natal yoga teacher and a journalist. My discussions are never objective, but they are informed. I hope to inspire, I never ever intend to judge. Che: "Look mum, a naked horse!" (ie. a horse without a saddle). First time horse-riding. Poet: In a vintage terry-towelling bonds suits. She works the camera. On Wednesday night I had the privilege of seeing the new Australian documentary The Face of Birth. I was in a cinema full of midwives, mothers and pregnant women. We were all eagerly anticipating a series of interviews with the world's leading birth experts - Michael Odent, Ina May Gaskin and Sheila Kitzinger to name just a few. The Face of Birth offered a balanced discussion about birth - regardless of where or how you birth your baby the experience can be empowering. Its very essence was this: "If you are pregnant, take the time to prepare so you can make informed decisions - take responsibility for your journey." The amount of women suffering from post traumatic stress disorder after birth is on the rise - does this suggest that birth, for some, is a battlefield? We are living in the 'labour bypass era' where many women don't think they have to do their labours. "For the first time in the history of mankind the number of women who give birth to the baby and the placenta thanks to the release of a cocktail of love hormones, this number is approaching zero" - Michael Odent. "There's a perception that only strong women have homebirths...which I find extraordinary because I think that all women are strong." - Noni Hazlehurst. Aboriginal women have a right to birth on their land, in their community. At present, there is only one part of Australia that allows this to happen. In most cases the pregnant woman will be flown to the nearest hospital at 36weeks and will wait to have her baby. This time period is called 'confinement.' (I find this absolutely appalling). "We don't lose many babies in Australia; we're very lucky because we've got good nutrition and good social circumstances. But what we do lose are a lot of marriages and a lot of relationships and a lot of people's mental health after childbirth" - midwife, Jan Ireland - thanks for the reminder Jess. For more information and statistics, read Co-Director Kate Gorman's letter here. It was wonderful to see so many of my past and present students there on the night. One of them, Selena, was 41weeks pregnant. She left the cinema at about 10pm and told her midwife that she felt nothing but inspiration for her imminent birth. At midnight her waters broke and at 3.09am she birthed her baby boy on her yoga mat - in the comfort of her home. Update: I have deleted some of the sentences from the original post. Perhaps my passion can sometimes get in the way of my statements - hence they can come across as judgements which I would never, ever intend to make. I write about birth to offer information and, perhaps, inspiration. I don't think, as mothers, we are ever going to have the same stance on birth and I would never expect my readers to agree with everything I say here. I write as a mother, pre-natal yoga teacher and journalist. My discussions are by no means objective but they are informed. I am thrilled to be one of 13 bloggers chosen to take part in the Sakura Bloom Sling Diaries. 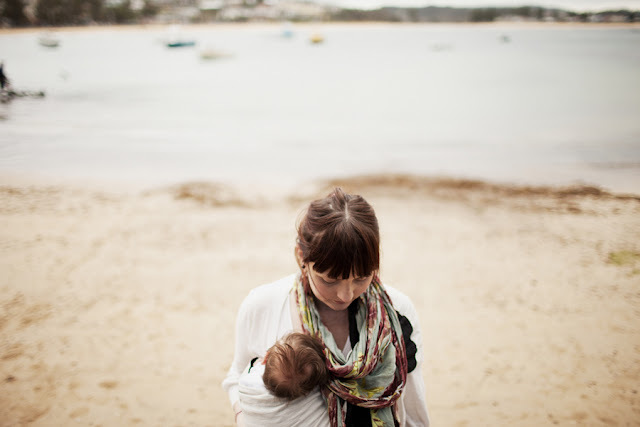 Once a month for the next six months I'll be posting a photo diary of babywearing - kanga and roo style, me and Poet. Each month will be inspired by a different theme; the first month is 'love'. The judges' favourite photo from each entry will be posted on the Sakura Bloom pinterest page and, at the end of the competition, a favourite "Sling Diary" will be chosen. Over the six entries I'll be reflecting on my babywearing experience with Che and, of course, living the experience with Poet. It's pretty special 'wearing' my babies, cuddling them close, having them near, chatting as we walk. Extending the oneness of muma and baby for just that little bit longer. Of course, there's something completely desirable about having two free hands too - let's not forget the practicalities! Leigh from Marvelous Kiddo (who could be birthing her third babe as I type!) will be introducing the 13 bloggers sometime today and launching a Sakura Bloom giveaway. Head over there to 'meet' the mumas and babies. Rather fortuitously I'll be spending time with both Tim and Luisa in the next few weeks...I can't wait to see what they capture. Tim took these photos when Poet was a hairy little six-week-old bubaloo. I wear the essential linen sling in organic raven/maple. the daffodil-yellow bonnet is the handiwork of a clever little knitter known as dover and madden. Unfortunately my knitting skills don't extend beyond a basic cast-on, knit, change colours, knit, cast-off repertoire. For now I'm getting quite good at tying up the bonnet and emphasising the importance of wearing such an adorable hat. "She doesn't understand what you're saying," says Daniel. "I know, but it makes me feel better if I explain it to her." Poet rips the hat off again and laughs. She's all tongue-sticking-out (see last photo) blush-cheeked, fired-up cuteness this week. She's ready to rumble and, quite literally, tumble her way around. Daniel and I, we've parented before, but this time it's a completely different ride. Getting the woollens out in preparation for Tasmania. Che: When he put his beanie on I saw a much older boy. It scared and delighted me in equal measure. Poet: Does not like wearing hats. Lucky this yellow number has a tie! I went searching for colour on the weekend and found it in bursts around the home. It was heartbreaking to sit at the computer as big, happy sun-rays made their way across the backyard but the cups of tea and regular chats with Che made it a little easier to bear. Daniel took the kids out in the afternoon so I could write in the quiet. It was bittersweet, I tell you, knowing that they were frolicking in Sunday afternoon light. This morning in class I encouraged my students to visualise their breath as colour, the first colour that came to mind, and to see that colour move down to and then away from their baby. It was nice to think of all those babies growing, surrounded by soft hues of pink, blue, yellow and lilac. Che came home from school today and shared his first story of a girl crush. He told us that he kissed Kaia, that she's really pretty and that she wears her hair in a bun "...just like you do Mum." It was the sweetest thing I've ever heard, the most innocent, colourful words. It rained a lot this week. Grey skies, little light. Che: Daydreaming. Reminds me so much of this time, when I was setting up his bedroom. Time is just repeating itself. I'm on the tail end of the housekeeping which means the fun is about to start. Poet's room! The walls have been cleaned, there's a new white blind and she's been given her auntie's old single bed. Of course, she's still sleeping with us in our bed so we'll use this for day sleeps, afternoon reading sessions and, perhaps, a place of solitude when a few hours sleep without being kicked is necessary (the girl kicked whilst on the inside and she kicks pretty hard on the outside too). I'm aiming to create a calm, whimsical room that encourages beautiful play and restful sleep. For a cancer baby born in the water Poet has a significant amount of fire within, hence the need for a soft slumber space. I've got a few heart garlands tucked away, some sweet alphabet cards, a few vintage books and, of course, a (small) bundle of toys. I'm in no rush to complete it...rather, I'm enjoying the 'coming together' of it all. But there's just one thing I'm undecided on - is this cute or creepy?